This is a summary of the situation to put all the posts in one place. You can read this as an alternative to the other posts – though I will leave the original posts up for posterity. There are some versions on the web that are wildly inaccurate. All I will assert is that the Biden's firm has been shockingly sloppy about basic due diligence issues. Unsurprisingly the inaccurate versions are coming from right-wing politics driven blogs (who like the idea that Biden's family is in trouble) and who reinvent complex facts to fit their simple world view. Some of the financial blogs have been much better. The short version is that an allegedly fraudulent hedge fund (Ponta Negra) shared an office and a phone number and a common marketer (Jeff Schneider) with Paradigm Global a fund of hedge funds owned by the Vice President’s family. Paradigm Global have said that they were subtenants – and that they were introduced via their common marketer. The story however is murkier than that simple explanation. However it is consistent with repeated and extreme sloppiness by the Vice President's family and the fund of hedge funds they control. First we run through the players in this drama. Ponta Negra is a hedge fund run out of a unit in Connecticut that just had its assets frozen by a Federal Judge and had the SEC accuse it of fraud. The Justice Department has yet to file criminal charges and unless criminal charges are filed you would have to wonder what the point of the current crackdown is. The alleged fraud is brazenly simple. The company simply produced fake return numbers and doctored accounts from their counterparty brokers to over-represent funds under management. The last set of published return numbers I have access to is here. Ponta Negra was run by Francesco Rusciano – who is also alleged to have faked trading data whilst working for UBS. Francesco Rusciano sometimes goes as Krancesco. Ponta Negra was marketed by Jeff Schneider and Jared Toren. More on those individuals later. Paradigm Global is a fund of hedge funds headquartered on the 17th Floor of 650 Fifth Avenue. It was founded by Dr James Park who for a while had a reputation as a guru on hedge funds. Paradigm in marketing documents claim particular expertise in “due diligence” allowing them to source the best hedge fund managers. 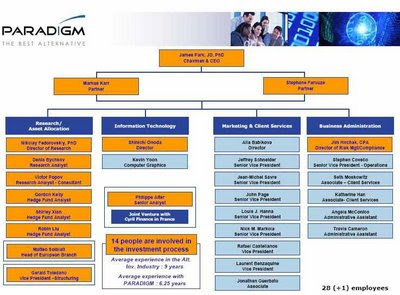 Paradigm claimed as recently as 2006 in marketing documents that it had over $1.5 billion under management and 28 full time staff as well as offices in New York, Monte Carlo and Tokyo. Now (according to its IARD filing) it has about 300 million in 210 discretionary accounts and 6-10 employees. There are no offshore offices. As recently as a few days ago their website claimed that they had never had a down year and that their volatility had decreased over time. This is not impossible – but if it is true that last year was a year of decreased volatility then the performance is truly remarkable. Consistently positive returns with low volatility make an 80% reduction in funds under management somewhat difficult to explain. Paradigm was purchased by Hunter Biden and James Biden who are the Vice President’s son and brother respectively. Hunter Biden was CEO was for a brief time at the end of 2006 and in early 2007. The original press reports implied that was a permanent position but it was later described as an interim position. The leadership of the firm since then has been moveable. In the latest IARD filings Hunter and James Biden are listed as owners. Markus Karr is listed as the chief investment officer and CEO. Dr Park is listed as an investment consultant. Hunter and James Biden purchased Paradigm when they wanted to get out of the lobbying business. Having your son as a highly paid registered lobbyist was incompatible with Joe’s (Vice) Presidential ambitions. The purchase was problematic and litigated. During the litigation James Biden signed an amazing affidavit which you can find here. The Paradigm Hedge Funds had only between two and three hundred million dollars under management, which were leveraged to over five hundred million, not the more than $1.5 billion under management represented to us by Lotito and Fasciana. These are things which is would make continued ownership of the business untenable. If James Biden is alleging that the returns have been misrepresented to clients and potential clients then he is alleging a crime. It’s a crime not fundamentally different the crime which Ponta Negra is alleged to have committed. The only responsible course of action for the Bidens would be – after being made aware of the problem – call the regulatory authorities, sack the offending staff and write a letter to clients indicating that they can have what is left of their money. Even a small misstatement of returns to prospective clients constitutes a crime. If the Bidens were to continue to own the management company – and to take the benefit of that ownership – without taking these steps then the Bidens are accessories after the fact to that crime. The alternative hypothesis (clearly possible) is that the returns were misrepresented to the Bidens but were not misrepresented to clients. Then no crime has been committed on clients and it is possible to keep running the fund. Anyway given one possible misrepresentation I figured I would go looking for other misrepresentations. This organisational chart differs dramatically from the current structure as described in IARD filings (6-10 employees). It is unclear when the employee numbers were scaled back so dramatically. Moreover it is very difficult to trace many of these employees in FINRA’s database which means if the people exist they are no longer licensed within the industry. Again it is possible that the firm used to have 28 staff and now has 6-10. Indeed the rapid decline in staff numbers might be the reason that there was space to sublet to Ponta Negra. In the IARD filing they handle client cash and a related person handles client securities. Moreover that related person is not a broker dealer subject to SIPC protection. Whilst holding client assets in house is not a certain indicator of fraud it is a huge red flag. The lesson of Madoff (or Stanford for that matter) was that a fund that actually controls custody of client assets is dangerous – whereas a fund which has custody at a reputable independent custodian or prime broker is unlikely to outright steal your money (though they sure can lose it). The really big frauds have been funds with inadequate external controls over custody. Bayou for example was another hedge fund with controlled its own custodian. There are legitimate reasons why a financial institution might use in-house custody. A bank for instance really does take custody of your cash. However I can’t see any good reason for bringing custody in-house as your staff numbers shrank by two thirds and your business model remains unchanged. However telling people you have third party custody when they do due diligence but not having it is fraud. I presume no fraud and that they must have bought the custody in house possibly to save money. However I am still worried about custody. This audit report lodged with the SEC specifically mentions material weakness with respect to safeguarding of securities. Having material weakness in custody arrangements allows theft. That makes it a very bad audit report. All of these red flags – the decline in staff numbers (28 to 6-10), the decline in funds under management (over $1.5 billion to 200-300 million), the returns that James Biden alleged were misrepresented and the unusual change in customer asset custody probably happened before the Bidens had purchased the management company. They must have all happened despite the fund making positive returns better than indices and with reduced volatility (as claimed on the website). There is one more red flag – again pre-Biden ownership – which I have not previously discussed on this blog. That is the Canadian fund called Paradigm Global. Canadian Paradigm Global was associated with James Park’s Paradigm Global and often claimed that James Park (then the hedge fund guru) had a consulting relationship with them. That relationship ended and the Canadian Paradigm changed its name to Portus Alternative Asset Management. Portus was later discovered to be a ponzi which – in typical ponzi fashion – paid its distributors well over the odd to distribute its toxic product. James Park was clearly involved in this fund in its beginning and lent his reputation to it – but he was safely (and probably reasonably) distant by the denouement. You can find press reports here, here and here. Onyx Capital was how I found this mess. Onyx – was a firm based in Austin Texas but also subleasing space from Paradigm. Onyx was a marketer of hedge funds to relatively unsophisticated clients. I say “was” because Onyx appears to be running dead – and its website died a few days before Ponta Negra was closed by SEC action. The typical sort of client was someone who had sold a medium sized business for a lot of money (a few million) and was looking for investment advice including what the smart money (that with a New York address presumably) was doing. Sharing a New York address with a firm owned by the Bidens probably helped. The principal of Onyx was Jeff Schneider. To complicate research he spells his name multiple ways. Onyx – being a seller of hedge funds and financial advisor – was almost certainly required to be licensed but never was. Jeff Schneider has a past which would raise eyebrows in most people doing a due diligence. He was “allowed to resign” from Merrill Lynch after allegedly being party to fraud by foreigners. In that case he denies guilt. He was sacked from CIBC, fined and given a 90 day industry suspension for allegedly defrauding CIBC’s bonus system. In that case he neither accepted nor denied guilt but accepted the fines. You can find the details in his FINRA broker registration statement. Anyway Jeff Schneider was a full time employee of Paradigm Global from 2004 to 2007 or 2008 (his FINRA regulatory records say Feb 2008 but Felix Salmon gives a different date). After that he worked for other firms, notably Puritan Securities. He also set up Onyx – but his FINRA record states that was working at Onyx only from March 2009 though other records suggest he established Onyx much earlier. I have an email from Ponta Negra dated June 2008 giving Schneider an email at Onyx. The FINRA CV (compiled by Schneider) is thus false. The decision to allow Schneider to cease being a full time employee but to maintain an office within Paradigm Global’s office and to continue to state in some marketing documents that he is an employee was made when the Bidens controlled Paradigm. Felix Salmon is characteristically blunt about Onyx and Schneider. He describes it as the hedge fund equivalent of a chop shop. That said – it was probably Onyx that turned Ponta Negra into investigators. Because Onyx is largely based in Austin Texas the Texas division of the SEC is taking the Ponta Negra case. Onyx distributed other dodgy product – most notably the head of investor relations at Onyx (Justin Hare) was also a full time sales employee of Stanford. Justin Hare’s myspace page (which has since been made private) is the source of the photos of the glamourous life of a Stanford salesman that I posted here. Anyway Onxy and Jeff Schneider introduced Paradigm to Alan Stanford’s organisation. Paradigm obviously thought fairly highly of Stanford and vice versa because they launched a cobranded product – the Paradigm Stanford Core Alternatives Fund. According to the Wall Street Journal no Paradigm money got sent to Stanford though some Stanford moneys were sent to Paradigm and I gather have since been returned. This suggests carelessness on the part of Paradigm. Financial institutions are fundamentally based on trust. If people do not trust you then you do not have a business. The Stanford relationship was the second time that Paradigm had lent its name to a large-scale ponzi (the first being Portus). Remember that Paradigm – being a fund of funds – is meant to be an expert in due diligence. And they failed. Badly. There was one other ex Paradigm employee who later worked at Onxy – that is Alla Babikova. If you go back and look at the org chart above she essentially runs the sales function. She was Schneider’s boss in those days. At Onyx Schneider it seems became her boss. I have saved Alla Babikova’s FINRA record here. Unlike Schneider’s it is clean. Jared Toren was also an employee of Onyx – though I gather he might have left Onyx to market for Ponta Negra. He also has a clean FINRA record but one that does not mention for instance that he once shilled for Onyx. I have emails from him in that function. The record is – at best – incomplete. At a minimum Jared has made minor false representations to regulators. Paradigm in the pre-Biden days also used to employ John Page. He had the same rank as Jeff Schneider in the above org chart. His 30 page long FINRA record (which you can find here) is full of customer complaints settled for six figure sums. His regulatory problems existed both before and after his employment by Paradigm. John Page was eventually forced to bankruptcy by UBS who sued him for repayment of bonuses and commissions that they had previously paid him and I think for moneys that they had paid out to clients as a result of his infractions. As noted above – Paradigm appears to be careless about who it employs and associates with. This blog observed for the first time that Ponta Negra was (a) housed within the offices of Paradigm Global, (b) had a phone number that was the Paradigm Global switch and (c) used the same marketing agent as Paradigm – a marketing agent who is often listed as a full time employee of Paradigm. That marketing agent was Onxy/Jeff Schneider. Moreover this is the third time that it has been publicly confirmed that Paradigm has associated itself with an alleged fraud. The prior two were Portus and Stanford. This suggests a degree of clumsiness – and it is a real problem for funds of funds. Funds of funds have – as their single most important skill – the ability to do due diligence. And the due diligence on Ponta Negra was really easy. My original post on Ponta Negra is repeated at the end of this post. Pretty well everyone with any real expertise I showed this to came to the same conclusion as me. It was highly suspect. The marketing literature failed basic requirements – not mentioning consistent custodians or auditors and having returns inconsistent with the strategy. The Paradigm/Onyx/Ponta Negra/Biden story has hit the main stream press (at least if you consider FT Alphaville and Felix Salmon at Reuters to be mainstream press). I see little to object to in any of their stories (FT here and here and here, Felix here). The line they take is essentially that Paradigm Global – owned and controlled by the Vice President’s family – is less than careful about who it associates with and who it lends its name to. However they accept that Paradigm Global itself did not know that Ponta Negra was a fraud marketed out of their offices. They accept the “we were dumb” view of how Paradigm got caught up with Ponta Negra (and also with Stanford before them). I have no evidence that Paradigm Global knew anything was wrong with Ponta Negra anyway. But plenty of evidence that they were sloppy. That in itself is a problem. Paradigm pitches itself as a highly sophisticated fund of hedge funds with superb due diligence processes. That they did not suspect that Ponta Negra was a fraud almost immediately suggests that their marketing spiel (excellence in due diligence) is only marketing spiel. When I wrote my original post on Ponta Negra (preserved below for posterity) it was blindingly obvious (to me at least) that Ponta Negra made no sense whatsoever. It should have been blindingly obvious to Paradigm too – but it wasn’t. About half the readers thought it was a scam – and the lawyers for Ponta Negra were sure I was implying it was a scam. Even the most cursory check on Ponta Negra would have identified it as suspect. Moreover in its literature Paradigm claims to have a database of just about every hedge fund and special skills at identifying scams. They were – it seems – just too gullible and they failed at their core function. I guess their advertising material – detailing extensive expertise at detecting scams- is just plain crap. Like their $1.5 billion under management and their custody arrangements and even (as alleged by James Biden) their stated returns. Paradigm rejects that the notion that they actively participated in the alleged Ponta Negra scam. That is an accusation I do not make. I only make the suggestion that – through clumsiness and the failure to perform even the simplest due diligence that they lend their name to alleged scammers. I also note that James Biden himself has sworn that Paradigm misrepresent their own return and makes allegations consistent with them misrepresenting themselves in marketing material. Paradigm’s only statement to date is simply to observe that Ponta Negra was a subtenant introduced to them by their common marketer. That defence would be entirely plausible to even the accusation of clumsiness except that Paradigm Global has a history of lending its name or reputation to (alleged) scam hedge funds. By far the most important was Portus Alternative Asset Management – an association that pre-dates any Biden involvement in Ponta Negra. But to pick Stanford and Ponta Negra suggests above average carelessness. And employing chop-shop operators like Schneider – who operates from an unlicensed investment advisory firm (Onyx) is also in great contrast to the due diligence that they claim they undertake when they invest their own money. This place is littered with red flags. There are more – but I think this should be enough to get the mainstream media and the SEC involved. Oh, and if I were Rusciano from Ponta Negra I would be busy finding a lawyer with experience plea bargaining. This story has a long way to run. I for one though will be signing off. I have real stocks to look at. The whole point of being a digger – and I am a digger – is to make money from that which other people have not worked out. And unfortunately I see no way to make money here. I regularly read the letters from fund managers more successful than me. I like to know what they are doing. Here is the letter from a fund (name withheld for now) which I do not understand. Can anyone explain this strategy to me? The global economic stress as measured by FX short term volatility, sovereign and corporate CDS spreads and VIXX indices persisted in the month of February, as the barrage of negative economic indicators remained unabated. Continued stress on the financial sector that peaked with the record quarterly loss of AIG and the collapse of Citigroup equity valuations has left policy makers and market participants perplexed as to how the current turmoil will be resolved. The month of February marked one of the most complex environments in foreign exchange that we have experienced since the inception of the Fund, as the ambiguity in governmental commentary on interest rate decisions and the measures being considered to aid the distressed economic climate caused abnormal gyrations in the G10 arena. We remain committed to our long DXY bias but as was mentioned in last month’s commentary, we have preferred to express this through a short EUR/USD bias and selectively partially imperfectly hedge it with a lower weighted long GBP/USD trade. We believe that the euro zone will continue to be weighed down by the massive 1.3 tn. EUR of outstanding debt of Eastern Europe that will be a challenge to refinance at reasonable yields in the current climate. The reversal of our short USD/JPY hedge was well-timed, as the announcement of the reissuance of U.S. Treasury samurai bonds to the Japanese marketplace has accelerated the upside momentum in USD/JPY. We have decreased the size of our short EM bias as commodity prices appear to have temporarily stabilized and we prefer to selectively express views through cross regional plays such as short EMEA/LatAm with underweights in HUF, PLN and overweights in CLP, BRL. We will continue to utilize low quantities of leverage and fewer numbers of intraday positions, as we anticipate the persistence of a high volatility marketplace into the end of Q1 2009. Now of course it would be nice to understand how these guys do it - because they are good. Very good. Here are there monthly performance numbers. 1. The FBI has arrested Rusciano - see this article. I can confirm that Folio Administrators Limited are the appointed fund administrator for Paradigm Global Fund. Folio has been providing fund administration services to Paradigm's offshore funds since July 2004. Again I will follow up. Congratulations sir, the entire write-up has been fantastic and has made for excellent reading. Good write-up. I think the bigger issue is always ignored is that you see a lot of folks making a lot of money because of their political connections. It feels like the US is becoming a Latin American country. Look at Mr. Daschle. Clinton's fund. Even Clinton's large speaking fees. Was he popular? Or was his wife seen as the next president of the US? I don't mean to frame this as a Dem issue, there is probably some of that in the GOP too. But It does seem really slimy. Fantastic work indeed, well done. How come none of the well paid financial "journalists" in the MSM ever discover such shady dealings, and don't even bother to run with your revelations? I guess it is too much hard work and they would rather just keep on regurgitating company press releases.